The Ivory Coast international scored his side’s winning goal away to Huddersfield Town today, but felt he was on the receiving end of some nasty challenges. 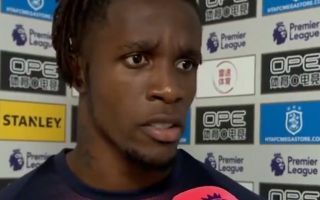 Zaha says this is not the first time it’s happened and has heavily criticised referees for not dishing out harsher punishments to his opponents. Speaking to BBC Sport in the video below, the 25-year-old questioned if he’d have to have his leg broken before more action was taken. Zaha is one of the trickiest players to deal with on the pitch with his pace and skill, but it’s clear he feels there’s no excuse for some of the methods defenders take to in an attempt to keep him quiet. "I feel like before anyone gets a red card I'd have to get my leg broken"